We believe in goal oriented and automated load testing. That's why we built k6 to work well in such environments, integrating nicely with services like GitLab and their "Auto DevOps" platform. 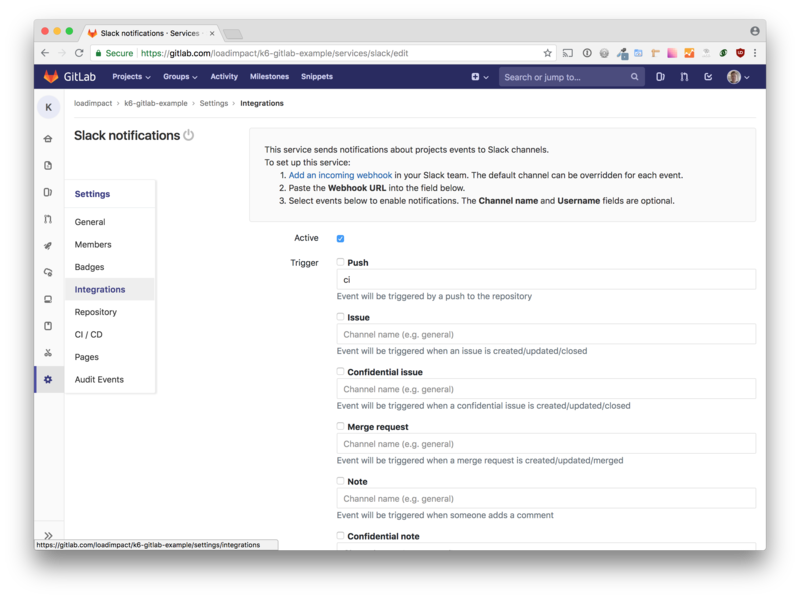 This guide will help you get up and running with k6, GitLab and Load Impact Insights (with build notifications sent to Slack). 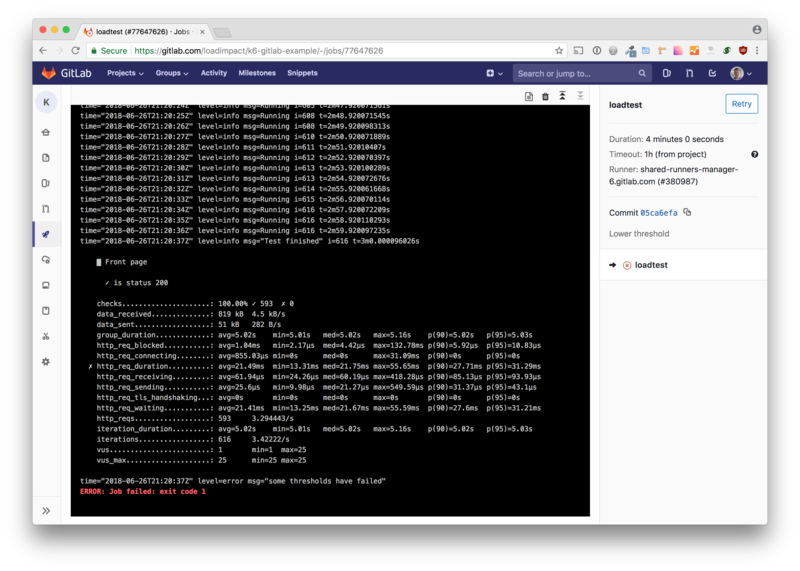 This guide assumes you are familiar with k6 and GitLab. It also assumes you have a Load Impact account. If not, go get one here – it’s free. 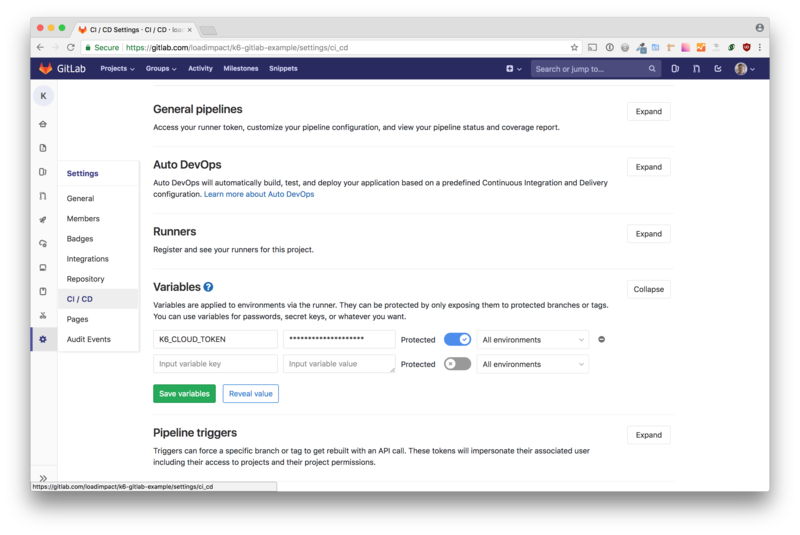 Once you have your account setup the integration with GitLab is only three more steps. 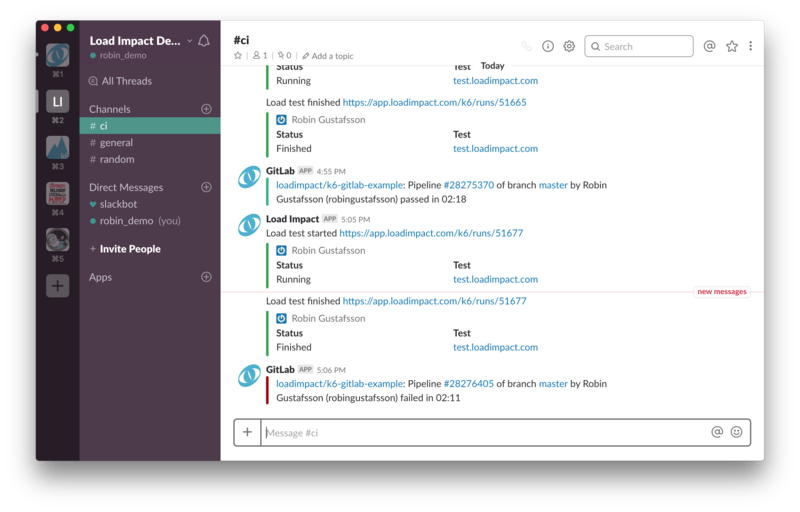 Wait for the build notification to arrive in Slack! 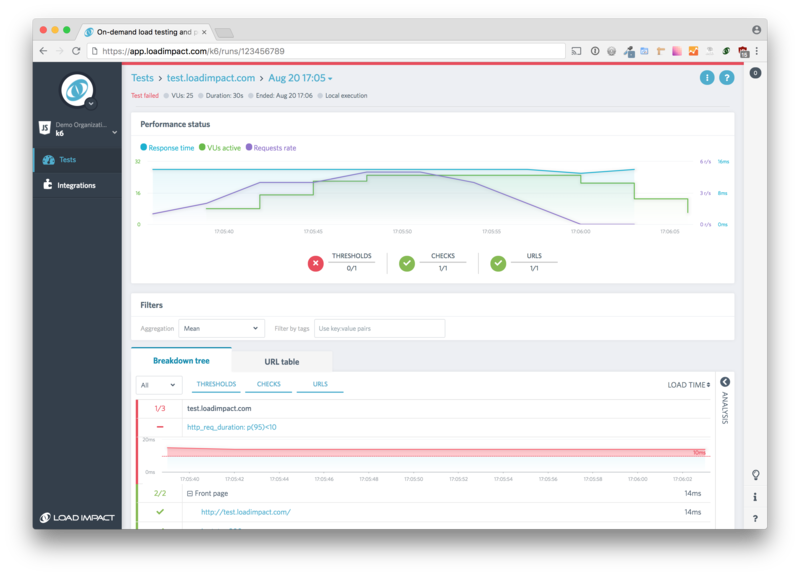 We've set a goal that the 95th percentile response time should be below 180ms. This step, k6 thresholds, is essential, it's how we define our goals which is the basis for the pass/fail mechanism to work that is built into k6. If a threshold fails, k6 will end with a non-zero exit code, which in turn indicates a failed build step to GitLab CI (and other CI tools). In the load test "main" function we define a group Front page inside which, we make a request, check the response status code and sleep for 5s, before letting the user loop from the top of the function. 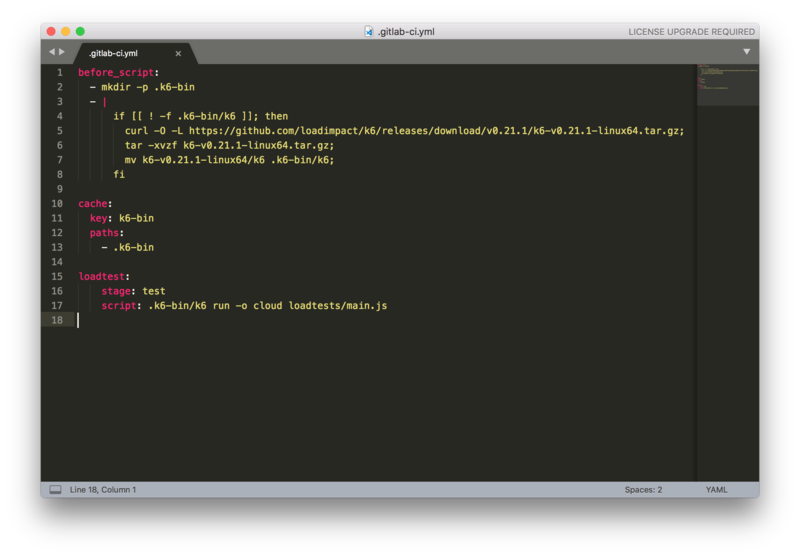 Below is the barebones .gitlab-ci.yml config file needed to run k6 and the above load test from GitLab, nothing more! Note that the k6 command includes the -o cloud option which means the results will be streamed to Insights (exclude that part of the command if that's not what you want). For that to work we'll need to make sure k6 has access to our Load Impact API token in the environment variable K6_CLOUD_TOKEN, so let's set this up next! A passing build is not much fun to look at. But, when builds fail, you want to understand why. No exception when it's a load test failing the build. We've built Insights to be a perfect companion to k6 for analysing results! The analysis workflow is error driven, meaning the goal is to help you quickly finding the cause of the failed load test. Read more about Insights functionality on this and adjacent pages in our Knowledge Base. 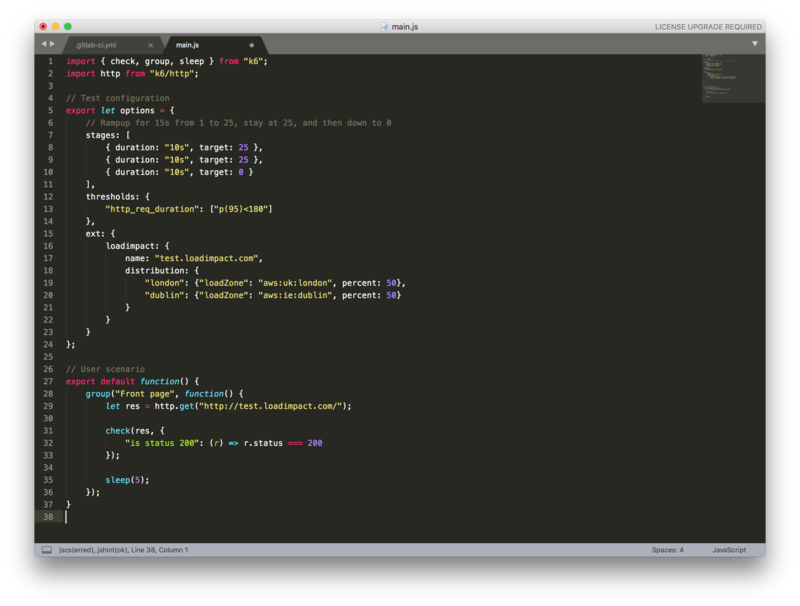 That's it, happy automated testing! How often should I run my load tests? There's no one answer here. We recommend against running load tests on every code commit though. Load tests are different in nature from unit, functional or integration tests. They need a longer time to complete and a target environment that is closer to real life (production) than the types of tests that are more functional in nature. Instead, we recommend that you run your test at a frequency that makes sense for your organization. You could for example run tests when merging code into a release branch or as part of a nightly build so you get your results fresh in the morning!